File Control is an invaluable Solid Edge data management solution that provides an extremely simple and efficient way of navigating through and working with all of your Solid Edge design data. 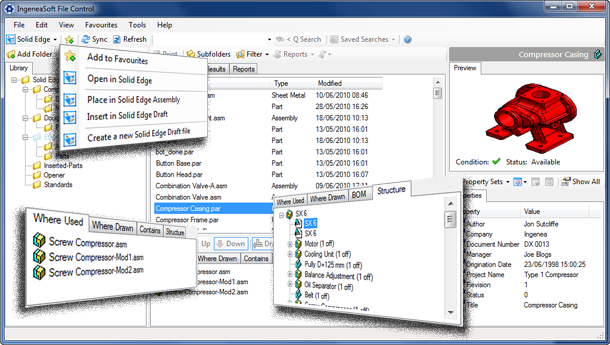 File Control provides an elegant solution to finding Solid Edge files and determining where certain parts or assembly are used. It provides instant results to these types of search queries. File Control is very quick to install and configure as well as being fast and easy to use. Simply identify the location of your Solid Edge design libraries and File Control will quickly and effortlessly build a live database containing all the property and link information for every Solid Edge document. This database resides on your local Solid Edge workstation or laptop. Whilst no network or server infrastructure is required to provide Solid Edge data management with File Control it can work in a multi user environment and where Solid Edge data is stored on networked file servers. File Control is the cost effective data management solution for Solid Edge users who either do not want the extensive capabilities provided by Solid Edge Insight and Teamcenter, or those who wish to control their local Solid Edge data files. If you are a Solid Edge user and currently running in an un-managed environment implementing File Control will save you so much time and frustration. Tutorials for File Control are provided via on-line streaming training videos. These training videos are freely available to anyone whether you are a File Control user, or a Solid Edge user considering using File Control and wanting to understand what it offers in more detail. Visit File Control - User Reviews to see what others think about File Control and post your own review. If you found this page useful why not spread the word and tell your friends and colleagues about File Control. Click on the appropriate buttons in our Spread The Word toolbar to the left of this page. You can use: Twitter, Facebook Like, Facebook Share, and automated email to individuals or to selected contacts from your address book. You can also use the Facebook Like button below instead of the one in the toolbar. This way you can share it on Facebook with a comment as well.